With Mexico playing the opening game of the World Cup against South Africa, fans may not have to wait long for a glimpse of Javier Hernandez. If the pre-tournament performances of the 21-year-old, nicknamed 'little pea' for his hazel eyes, are anything to judge by, what they will see from the young Mexican this summer will be something to delight Manchester United fans and strike fear into their rivals. 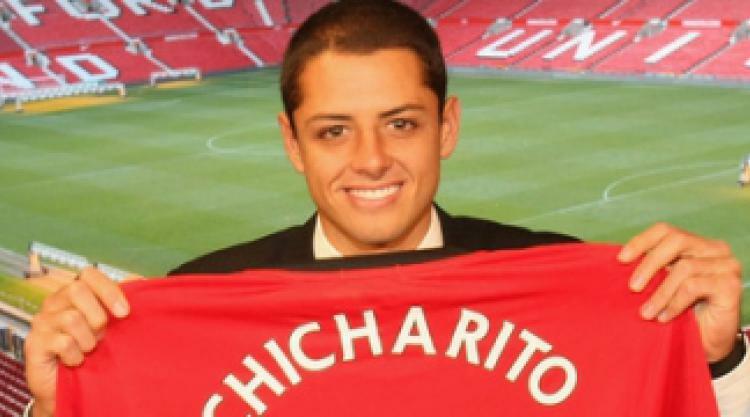 Hernandez, set to move from Guadalajara to Old Trafford after the World Cup. is the latest in a long line of Mexican strikers dating back to Hugo Sanchez in the 1980s to have the hopes of a football-mad nation thrust on his shoulders. Chicharito, all 5ft 9in of him, has done little to dampen expectations after scoring four times in his first five appearances for the senior national side and as the hits on YouTube videos of his goals suggest, his is a rare talent, capable of scoring spectacular goals with either foot. That Mexico have also been drawn alongside a weak South Africa, a fragile France and unpredictable Uruguay in Group A should also amplify their fans' hopes that their team is set for a long run in the finals. Mexicans do not hope their team can join the big guns of Latin America like Brazil and Argentina, they believe they are already up there, despite results proving otherwise. The best Mexico has done in the tournament is to reach the quarter-finals on two occasions, and that happened when the finals were on home soil in 1970 and 1986. A year ago, their prospects of even reaching South Africa under then manager Sven-Goran Eriksson were looking bleak with half the qualifying campaign already in the books and 'El Tri' - as the side are known - languishing in fourth place in the CONCACAF qualifying section with only three automatic spots available. Out went Eriksson and in came new head coach Javier Aguirre, who promptly coaxed 37-year-old playmaker Cuauhtemoc Blanco out of retirement and saw him act as the alchemy that turned a Mexican midfield and front line featuring Andres Guardado of Deportivo La Coruna, West Ham's Guillermo Franco and Arsenal youngster Carlos Vela into Aztec gold. Mexico quickly vaulted up the table, winning five of their last seven qualifiers and losing only once to claim second place in the final standings, one point behind the USA. Could Hernandez, still a student of business administration and whose father and grandfather also played for Mexico, be the next catalyst for success in South Africa? A year ago, as Mexico were struggling in the qualification standings, the player himself, who still lives with his parents, had his doubts he would even stay in the game. "He doubted himself; he doubted that he was capable of playing in the first division," Javier Hernandez senior, his father, told the New York Times recently. "As parents, we told him he had to be patient, but as a young player he was impatient. We talked to him about being persistent and in time everything would come." So it proved, his re-dedication to the game being recognised by Aguirre, a former team-mate of Hernandez Sr, who is now also among those charged with playing down not just Mexican prospects but those of Chicharito also. "He's doing his work, just like the others, with his club and the national team," Aguirre told reporters in March during a series of friendlies in the USA which saw Hernandez score a spectacular header against New Zealand. "I understand that a lot of you guys are not going to be satisfied with who I pick, but Javier is going through a very good moment and I hope it lasts."